I finally got around to shooting this space! 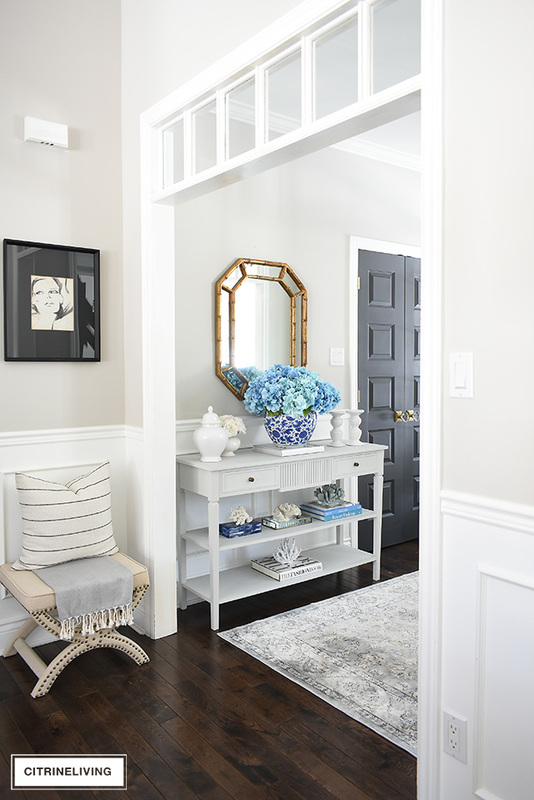 I’m very excited to be sharing my spring entryway decorating with all of you. 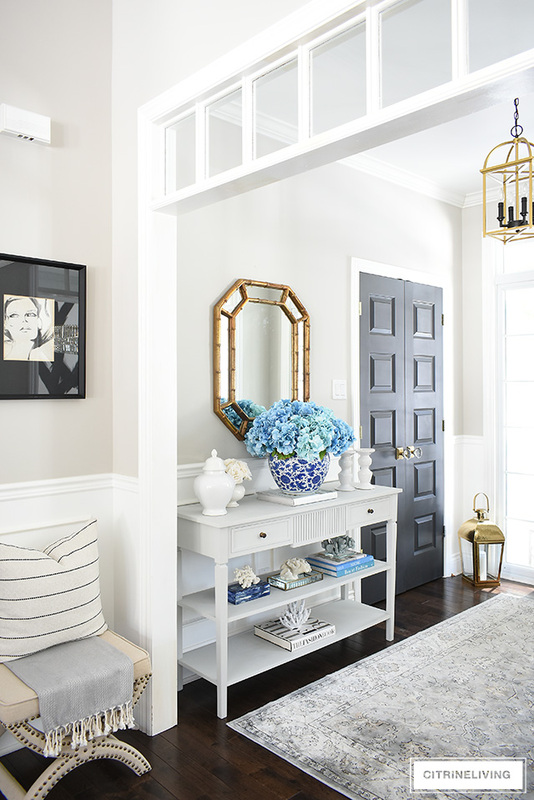 I know I’ve shared bits and pieces of my spring decor, and I only have one more space left to share – our dining room, which is coming to the blog in a little while! This has been a crazy busy spring for me, and while I try my very hardest to bring you guys new content each week, it can be tough while I’m managing my household, family and all of our lives! We’re knee-deep in dance competition season with our daughter and that takes a ton time and energy, you have no idea! Getting my son on track with school has been tough as well, he’s looking to change programs and leave hockey after playing for the past 11 years. Life has been just a little crazy. 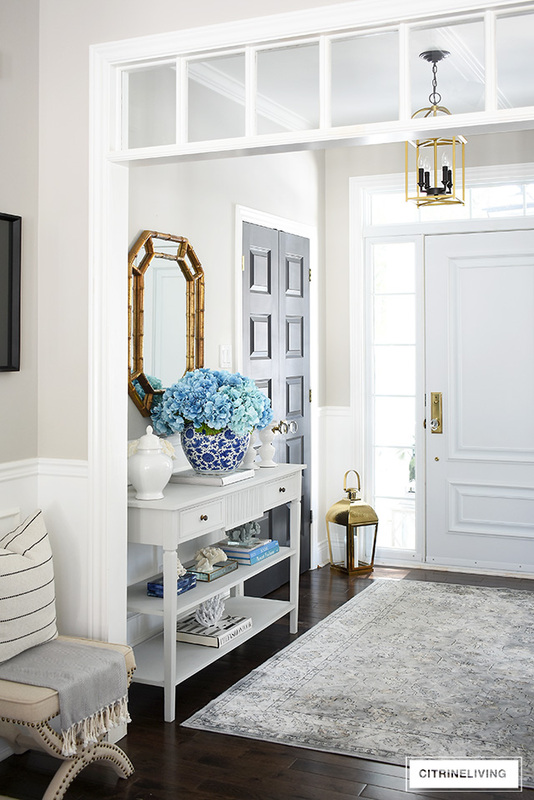 All that to say, it’s been a juggle of sorts, but I’m happy to be able to share our spring entryway decorating with you today – finally! If you’ve missed any of my previous spring posts, I’ll be linking to them below, and throughout my post, so you can head over and get inspired. Enough said, let’s get to today’s post! 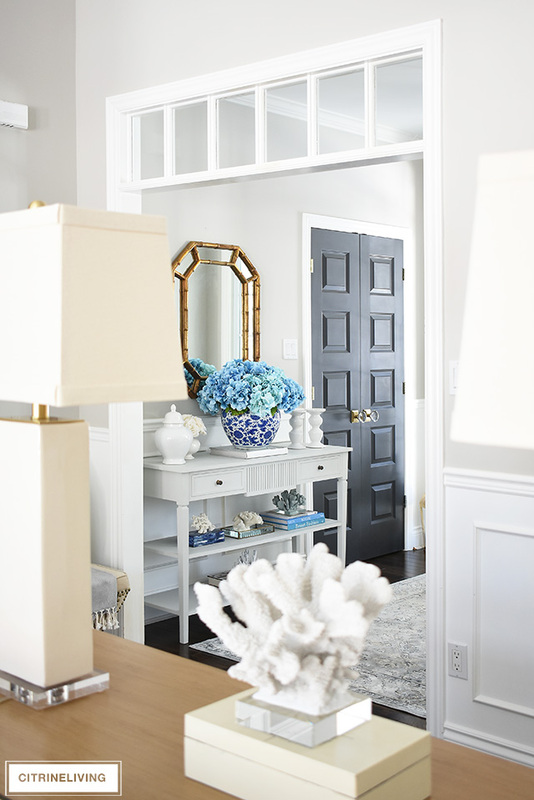 You may remember seeing sneak peeks of our entryway and console table a few weeks ago (read it here), I was in the middle of finishing up styling most of our home at that time. While it’s remained the same as an overall theme, I’ve tweaked things just a little bit, and I love the outcome! I kept it simple, focused and somewhat streamlined. 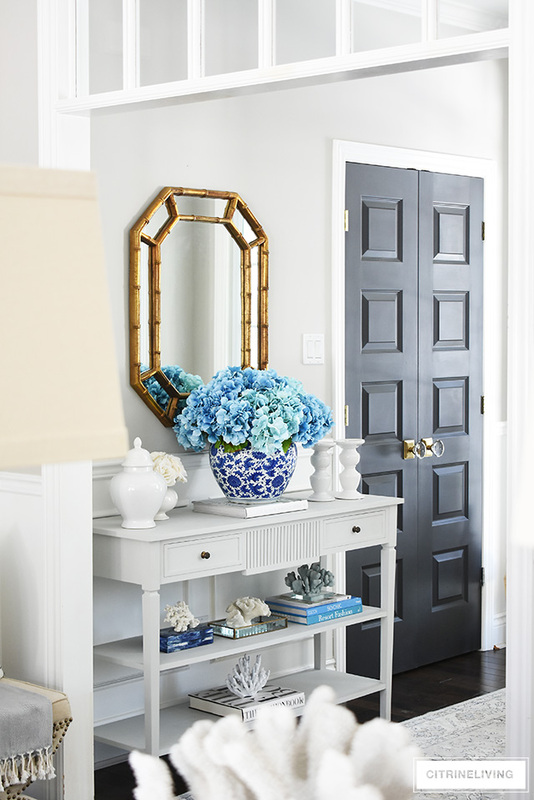 What I love the most about our entryway this spring, is my large-scale hydrangea arrangement. 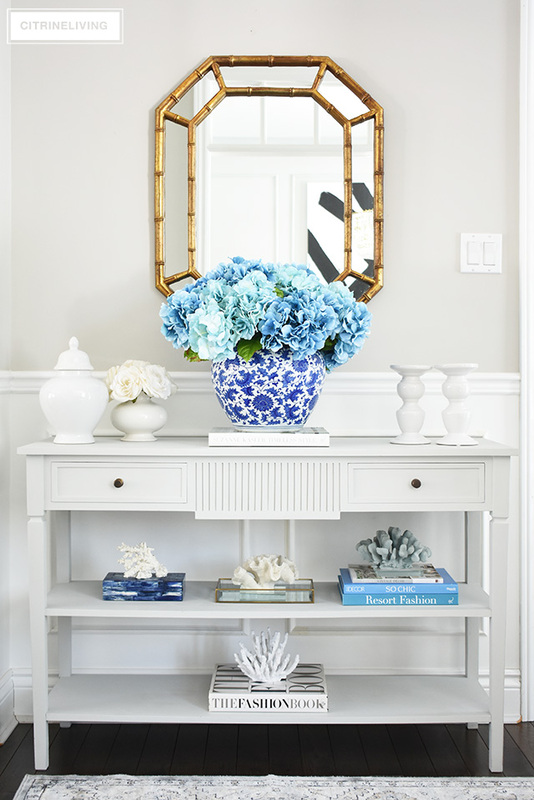 I decided I wanted my florals to be the focus on my console table, so I grabbed all of my blue hydrangeas from the arrangements throughout our home and used them here to create one large, statement piece. I love it. 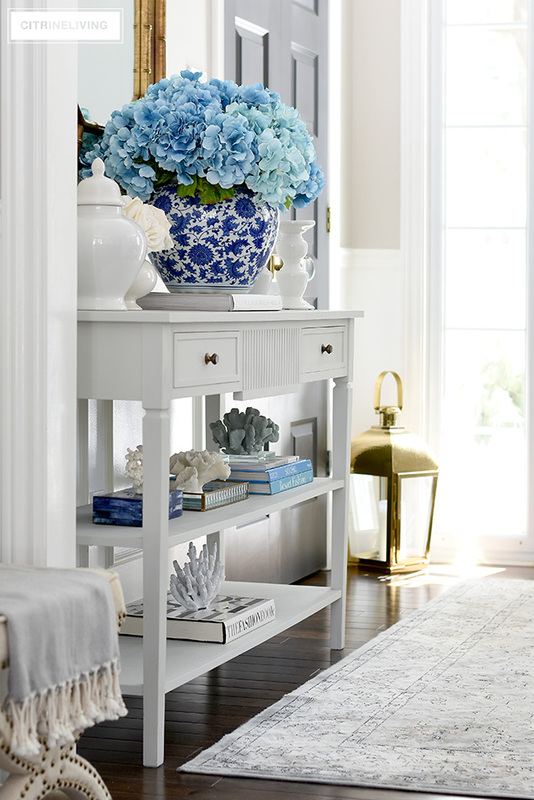 I kept everything else very simple and clean – a collection of coral sculptures (some of my favorites), design books and a few key pieces in white, flanking my arrangement. 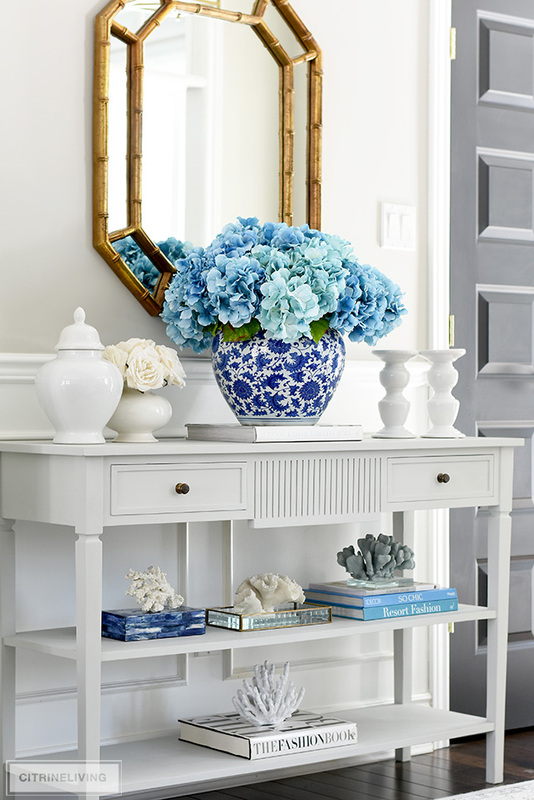 You know blue and white is a staple in our home, so for my spring entryway decorating, I kept it to just that. 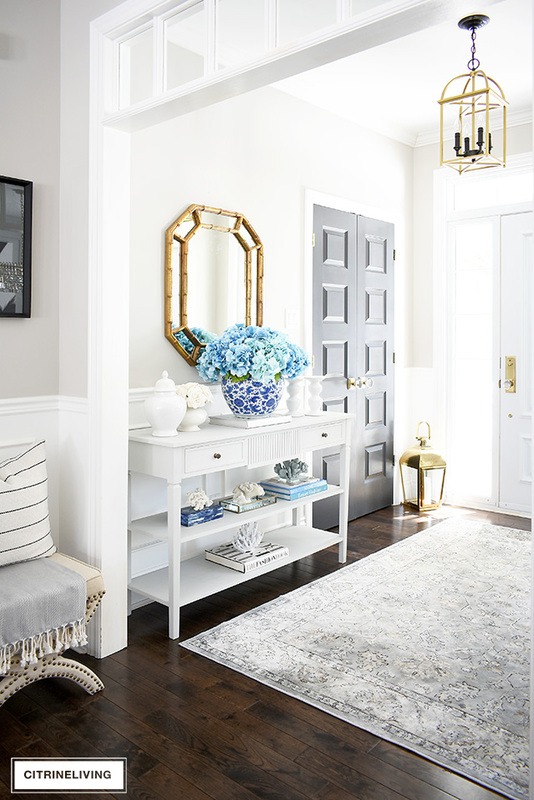 All blue and white, with a touch of brass from my oversized lantern to pick up on my brass mirror, light fixture and hardware in this space. Blue, white and brass is most definitely my favorite color combination, hands down. Any time of year! If you notice, with my arrangement being the focal point, everything else acts as supporting elements. I used just a few touches of blue – I didn’t want to use too much – it would have made this vignette too visually overwhelming. 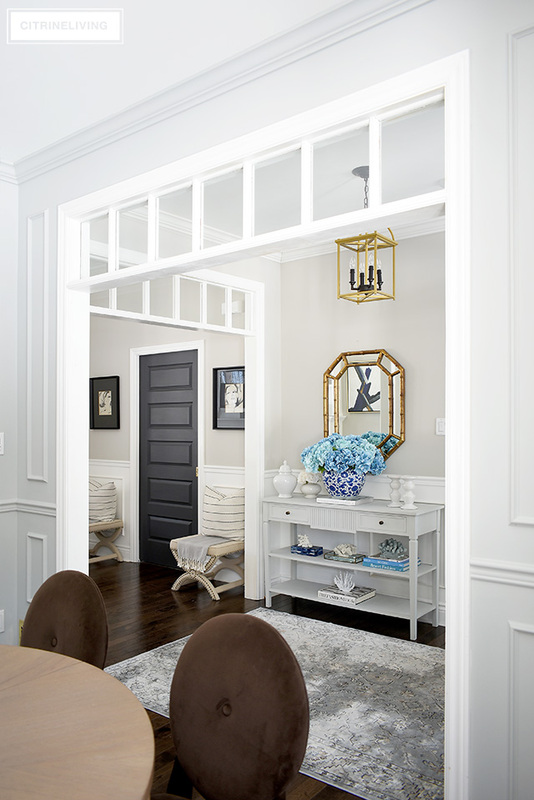 Keeping it to just a few touches of color allows for all of the beautiful textures to shine! Coral sculptures are perfect for adding texture, and there are so may different kinds you can find. One other thing that’s important to point out – I chose to balance the white pieces on the top of the table, with more white on the bottom shelf, to keep it light. 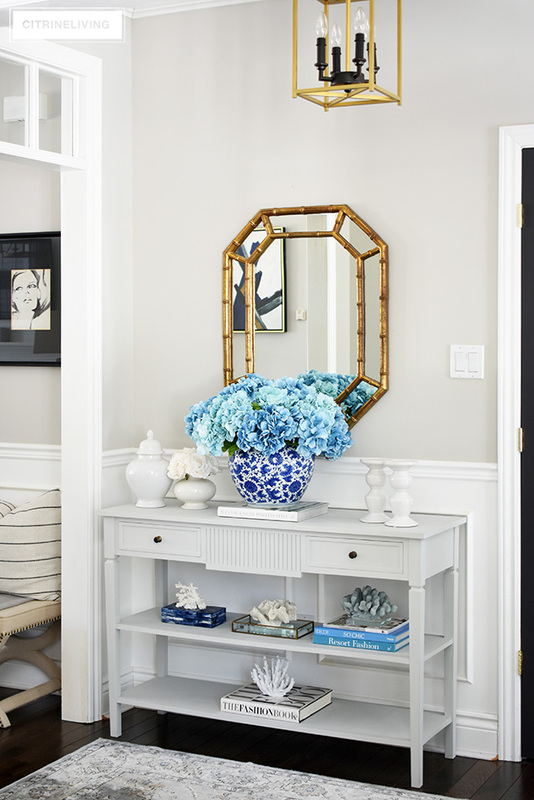 You’ve seen these gorgeous blue hydrangeas throughout most of my decorating this season, and if you remember, I used two different colors to give them more depth, and a more realistic look. There are ten stems in this arrangement – each stem has three round blooms, so that’s thirty blooms in total. I found them at Micheal’s on sale, 2 for 1 (my favorite kind of sale! ), and I’ve linked similar ones at the bottom. 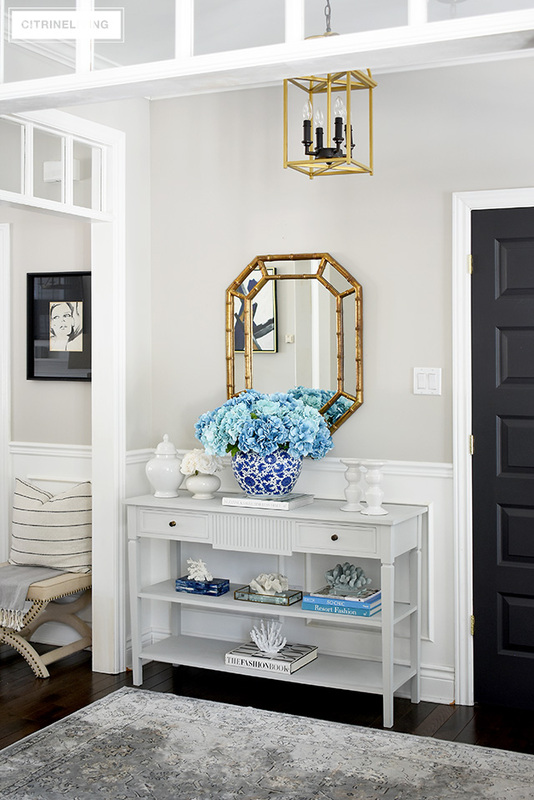 The large scale arrangement makes a true statement in this space, and I love how full it is. 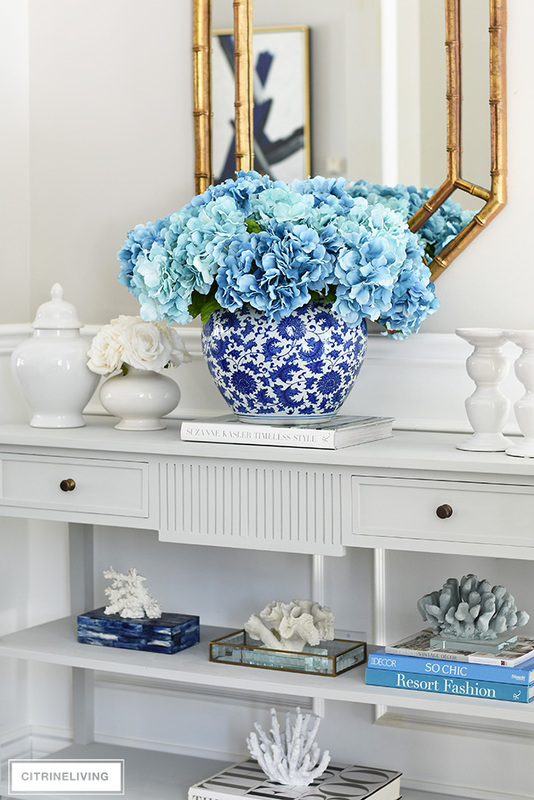 If only I could grow real hydrangeas this gorgeous in my garden! I have a different variety – Annabelle, in white – although I did plant some blue ones last year – I’m very curious to see if they lasted the winter…as my hubby always says, I have a black thumb haha, so I have no idea what to expect! The view from our dining room is so fresh, vibrant and pretty. I’m loving how our new grey walls frame this view. I think I need some light blue or grey dining room chairs, don’t you think? 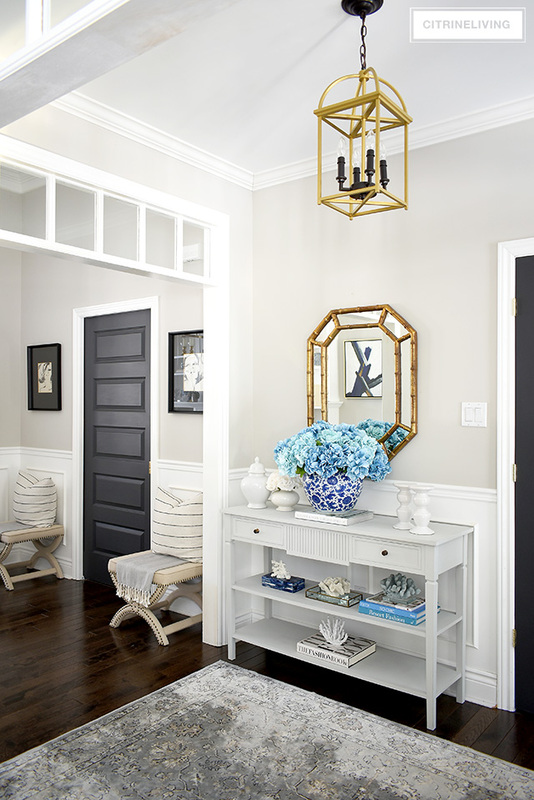 It doesn’t take much to create a welcoming entryway and it doesn’t take much to bring some drama while you’re at it. Don’t be afraid to try something different. I had no idea how this arrangement would look, but I needed to try it and see – experimentation is key! The best part is, I love the results! « WEEKEND FAVORITES: THE SERENA & LILY DESIGN EVENT! Good morning Tammi. It was so lovely to sit and read your blog while enjoying my morning coffee. The entrance turned out beautiful…..did ANYONE have any doubt about that! ?…lol…I love that you touched on ‘experiment’. 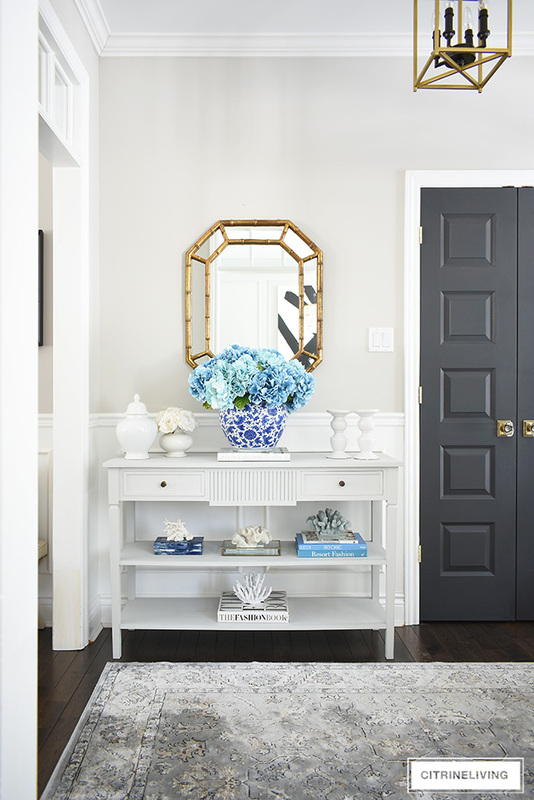 I painted my entrance door and large spindles on staircase black a couple of years ago…I am thinking of updating them to blue this year… it’s just painted right? lol….it will be a fun project. I am anxious to get home this spring (snowbird in FL) as I had a bathroom makeover done while I was away….gutsy right? Leaving it in someone else’s hands!!! LOL…you can check it out when you get a chance on my savvysnowbirds blog. Great post!!! !